The former president was allowed to participate via a video link. 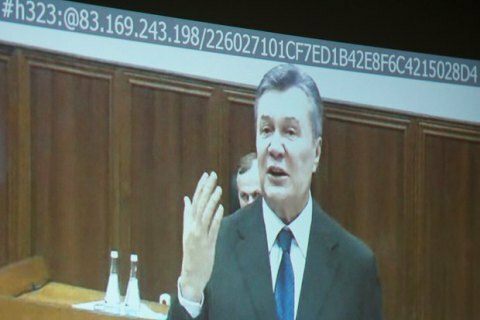 Kyiv's Obolon District Court granted the petition of Viktor Yanukovych defence team, who asked to organize the defendant's participation in the preparatory meeting via a web video link. For this purpose, the court announced a break in the hearings until 10 am on 18 May, an LB.ua the correspondent in the courtroom reported. The court ruled upon consultations that the defendant's request could be partially granted "to provide a programmatic opportunity for the accused Yanukovych to participate in the preparatory meeting by means of videoconferencing. The court agrees with the prosecutor's opinion that after the amendments to the Criminal Procedure Code, which entered into force on 15 April, 2017 The defendant Yanukovych has been duly summoned to the preparatory hearing," said the presiding judge Vladyslav Devyatko. "Considering Article 6 of the Convention on the Protection of Human Rights and Fundamental Freedoms, and also taking into account the practice of the European Court regarding the consideration of this category of cases, the court considers it necessary to provide the defence with additional opportunities for the participation of the accused Yanukovych in the preparatory hearing by videoconferencing," he added. The former president of Ukraine Viktor Yanukovych is accused of high treason. Yanukovych is facing the charges of high treason that he has on March 1, 2014, while staying on the territory of the Russian Federation. Yanukovych called on a written statement to the president of the Russian Federation with a request to use Russian troops on the territory of Ukraine. Subsequently, this led to the loss of Crimea and objects of state property worth more than 1,080 trillion hryvnia for Ukraine.